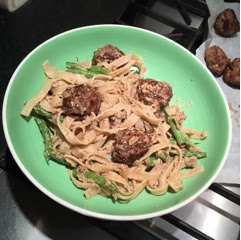 I had these delicious meatballs for dinner last week. I was in the mood for creamy pasta and this hit the spot. Break the bread into small pieces, sprinkle over 2 tbsp cold water and soak for 3 mins. Put in a large bowl with the mince, half the shallot, 1 tbsp parsley, 1 tsp paprika and 1/2 tbsp mustard. Mix with your hands until evenly combined. Shape into 16 meatballs and flatten a little. Fry the frikadellen in the oil over a medium heat, turning occasionally for 8-10 mins until cooked through. Remove from the pan and set aside. Add the rest of the shallot to the pan and cook stirring often, until soft. Add the creme fraiche, 100ml water and the remaining mustard, parsley and paprika to the pan and heat until simmering. Return the frikadellen to the pan. Cook the pasta according to packet instructions, adding the green beans for the last 3 mins. Drain. Toss the frikadellen and sauce with the pasta and beans. Serve.